﻿﻿﻿In the recently televised Canadian Débats Des Chefs – the debate was not about the best tarte tatin; rather it was regarding public policies on which the four leading political party leaders were verbally sparring to win scores with the Canadian public. The second-largest country in the world will be having a federal election on May 2nd. The party that wins the majority of electoral districts or “ridings” as they are called gets the plum Prime Ministerial post. You have to admire Canadian federal party leaders, the “Chefs”, for their language skills. They truly have to be bilingual in English and French to qualify for a government position, and on the practical side to join a national debate for two nights for two hours each - the first in English, and the second in French. In the English debate, only the Bloc Québécois Party honcho, Gilles Duceppe, was having a hard time articulating in English. And a major point he kept raising was the other parties’ stance on Bill 101. The bill mandates that French be the main working language in businesses in the largely French-speaking province of Quebec. But the Bloc now wants the law to apply to federally-regulated banks and telecommunications companies to the predicament of unilingual (in English) federal workers within Quebec. 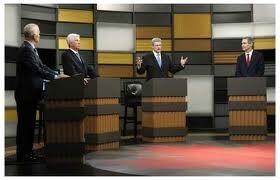 At the French debate, it was Canada’s Conservative Party Stephen Harper’s turn to remember the right French word. Mr. Harper grew up in Anglophone Toronto. Compared to the previous English night debate, where Mr. Harper was cooler than Obama, in the French debate Mr. Harper’s hand and body tremors looked like withdrawal symptoms (from the English language) probably resulting from his seeming uncertainty in French terminology. Not surprisingly, he scored the lowest in approval from Quebecers that night. Nonetheless to hear all debaters including Jack Layton of the National Democratic Party, and Michael Ignatieff of the Liberal Party, tartly argue in both debates with acceptable fluency is commendable, considering growing up in most parts of Canada does not engender individual bilingualism. Canada officially became a bilingual country just recently (by historical standards) in 1969 mainly to avoid the French-speaking province of Quebec from secession. Outside of Quebec, only one out of 10 Canadians can speak both languages. And in major metropolitan areas, you are more likely to hear Chinese, Pilipino or Hindi rather than French. For the sake of bilingualism, almost every label in the supermarkets is in both languages. Space wise it means it is harder to see the smaller font-sized calorie count, and amounts of fat, cholesterol, sodium, and carbohydrates, especially sugar. Perhaps this is one reason why diabetes and obesity are frequent topics in almost every media. And of course all government forms are bilingual but surprisingly not public signage. A street is just marked as a “Street” in Vancouver, British Columbia, and “rue” is just “Rue” in Montreal, Quebec. The most recent report on the cost of bilingualism was in 2009 by the Fraser Institute, a Canadian think-tank. The study found that Canada is spending up to $1.8 billion annually or at $55 per Canadian per year to provide government services in French. The reality is at least six out of ten Canadians conduct their lives and business solely in English. Back to the debate. Thank God for identical cognates, and Anglicisms, or should I say Americanisms. In English or in French, one can deduce from both debates that Américanisation du système de prison n'est pas bonne pour Canada. Et l'aide militaire pour la guerre Iraquienne n'est pas acceptable. Now, may I have a petite slice of tarte tatin, s'il vous plait?